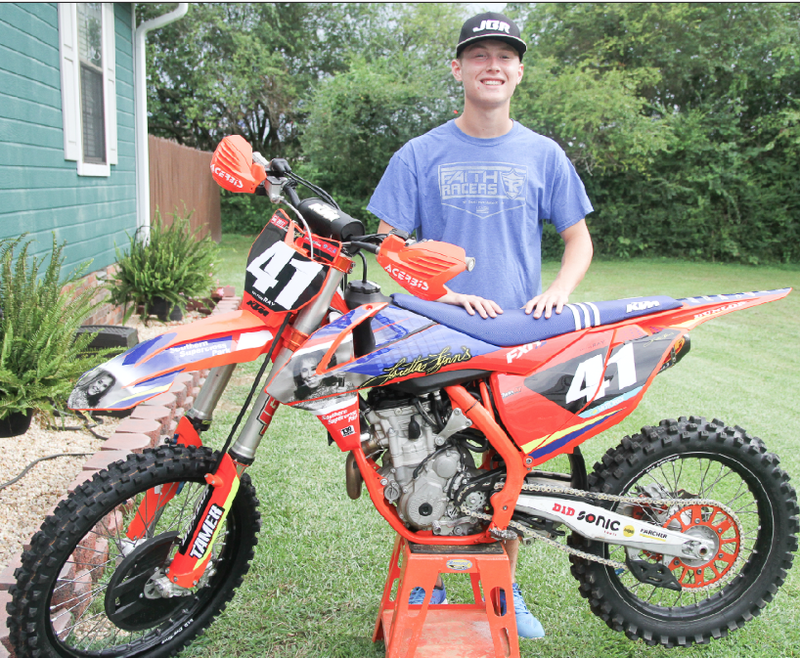 Kolton Ray is an elite motocross racer as well as an elite student. A senior, he carries a 4.3 grade-point average and is a member of the National Honor Society at Guntersville. Kolton Ray’s bike features special graphics for the Rocky Mountain ATV/MC AMA Amateur National Motocross Championship presented by Lucas Oil, which is scheduled for Sunday through Aug. 5 at Loretta Lynn’s ranch in Hurricane Mills, Tennessee. Ray qualified to compete in two classes. GUNTERSVILLE — Kolton Ray was 4 ½ years old when his parents, Kevin and Lisa Ray, gave him his first motorcycle, a Honda CRF50 with training wheels. 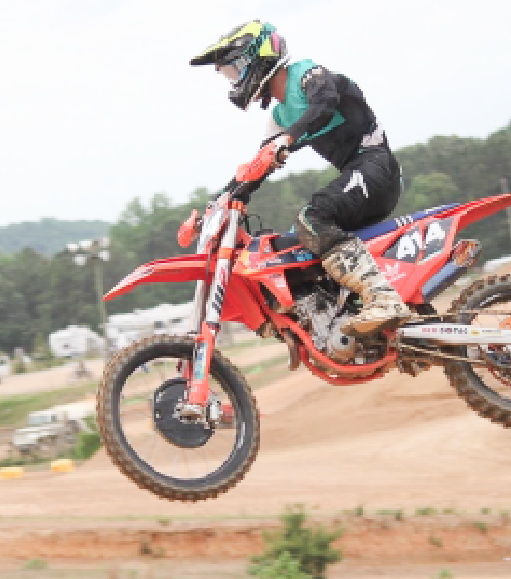 Now 17, the Guntersville High School senior has grown from his humble beginnings to become one of the elite amateur motocross racers in Alabama and the Southeast. Next week, Ray will test his skills against other top riders when he competes for the first time in the Rocky Mountain ATV/MC AMA Amateur National Motocross Championship presented by Lucas Oil at Loretta Lynn’s ranch in Hurricane Mills, Tennessee. Registration is Sunday with practice Monday. Racing starts Tuesday and continues through Aug. 5. The national championship features 34 classes. Ray is competing in two classes — the 250C junior 12-17 limited and 450C. He’s the only rider from Alabama in his classes. “There were so many times where I was like, ‘man, I’m not going to get in this year,’ especially after the first two regionals and I didn’t get in,” Ray said. “I was kind of stressing out because there was so much pressure on me. Ray’s road to Loretta Lynn’s began with qualifiers. Riders who place in the top eight in their respective classes advance to regionals. “It takes a lot of training and hard work to get ready for the qualifiers, and qualifiers aren’t easy,” Ray said. He raced in three regionals this year. Bike problems prevented him from securing a berth in the national championship during his first couple of regionals. His third regional was at MillCreek Motocross Park in Pell City, what he considers his home track. He finished in the top six in the 250C junior 12-17 limited and 450C to punch his ticket to Tennessee. Riders must earn a top-six finish in a regional to qualify for the national championship. “They only take 42 for each class, the 42 fastest in that class in the world basically,” Ray said. “It’s a rough experience trying to get there. It’s a lot of emotions. The emotions were crazy all year because I’ve had ups and downs. “I went a year without getting hurt, and then this February we were racing in Louisville, Kentucky, at a little arena cross, and my bike messed up going up the face of a jump and I broke my arm. Ray broke his left collarbone during a race at MillCreek in April 2015. An accident at McLarty MX Track in Blount County on Dec. 20, 2015, put him in the hospital. Ray trains with Mike Daley, a former sergeant major in the Marine Corps, and Chad Ward. “Mike Daley really helps me. He’s very motivational,” Ray said. “Chad’s rode with me a lot and told me a bunch of pointers to help me out. Kevin Ray expressed thanks to Billy Rains and Hugh Mozley for their help with developing his son’s career. Mozley is excited for Ray. He said it requires “a lot of money, a lot of work and a lot of luck” to qualify for the AMA Amateur National Motocross Championship. “It’s the biggest amateur race in the country,” Mozley said. “Qualifying for this is a long extensive road. You race your way into this race, and they take only the best riders in this country. Ray owns a 4.3 grade-point average and is a member of the National Honor Society at Guntersville High School. Some of his stiffest competition is from racers who are home-schooled. If Ray brings home a national championship, he will have quite a story to tell when Guntersville’s new school year starts Aug. 8. For more information about the AMA Amateur National Motocross Championship, visit the official website at www.mxsports.com or call 304-284-0101. Also follow the official Facebook, Twitter and Instagram accounts for exclusive content and to catch the latest news.